[ Edwardian Lingerie. ] Profusely-illustrated printed trade catalogue of 'Original Designs in Dainty Lingerie Etc by Robinson & Cleaver Ltd 156 to 170 Regent St London W'. Robinson & Cleaver Ltd, 156 to 170 Regent St, London W. Undated [ Edwardian ]. pp., 4to. Printed on shiny art paper, and stapled within light-brown printed wraps. Aged and worn, with slight damage to one corner (not affecting text or illustrations) and pin hole to one edge causing minor damage. Cover printed in gold with illustration of the Regent Street shop, inside covers with illustrations and text printed in black. Body of catalogue printed in black and purple. Several illustrations to almost every page, with accompanying text and prices. Autograph Letter in the third person from George Spencer, 4th Duke of Marlborough, apologising to the Prince Regent (George Augustus Frederick, later King George IV) for having to decline an invitation. 1p., 4to. In fair condition, on aged and creased laid paper with watermark '1810'. 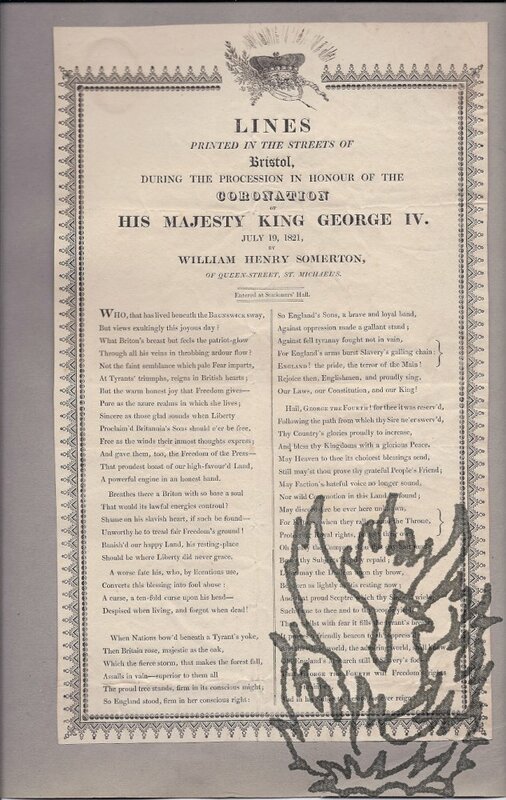 The letter reads: 'The Duke of Marlborough is very sorry it will not be in his power to obey His Royal Highness the Prince Regent's commands on Thursday the 23d of April, which he should have been very happy to have done had it been possible for him. | Blenheim | April 19th.' The only 23 April falling on a Thursday during the Regency before the 4th Duke's death was in 1812. 1p., on 29 x 7 cm piece of unwatermarked laid paper (probably cut down), with no indication of printer or date. Printed with the long s. In good condition, on lightly-aged paper. 64 lines, arranged in eight eight-line stanzas. 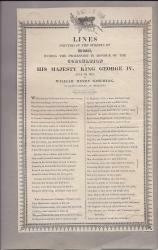 The first stanza reads: 'BRITAIN! brave and generous nation, | Listen to my plaintive strain, | Tho' exalted be my station! | Day and night I sigh in pain; | Here I came a helpless stranger, | With no friend to take my part, | Braved the stormy ocean's danger, | From home for ever to depart.' She appeals to her 'Good Uncle' (i.e. Manuscript and printed ephemera relating to the work of a Committee to remove the encumbrances on the Unitarian Chapel in Brighton. Five manuscripts items, 15pp., 4to (4), fol. (1); three printed items, 4to, some with MS. additions. The Manuscripts items are related to the printed and are as follows: a. 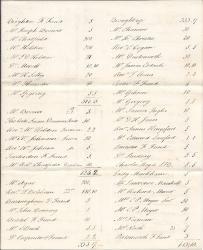 List of Subcriptions recd towards building the Chapel at Brighton (names and amounts). - Total, £1591.11-; b. 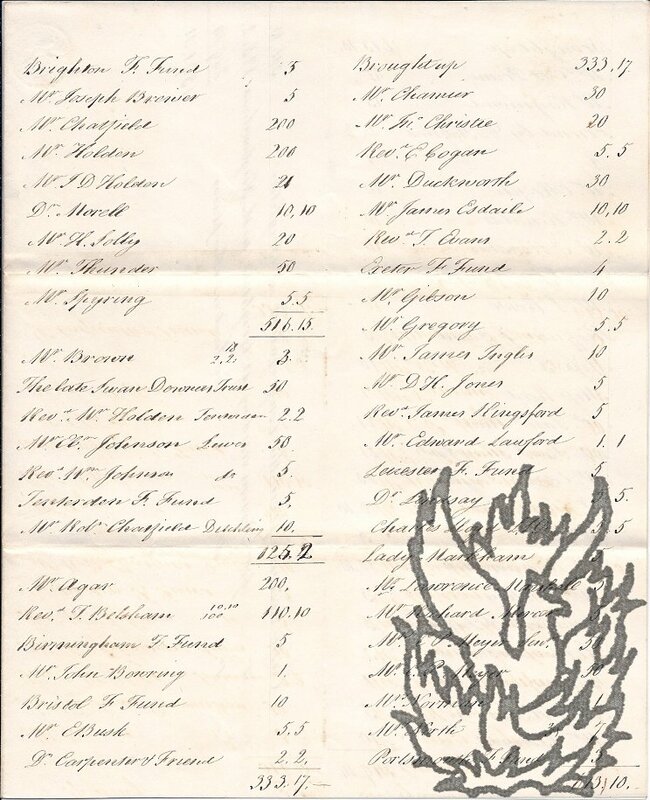 [Fol., partly detached at fold marks] List of subscriptions (name, place, amount, or just town or city for some reason) and donations, Aug. 1834. with crossings out and calculations, and a list including periodicals (as subscribers? 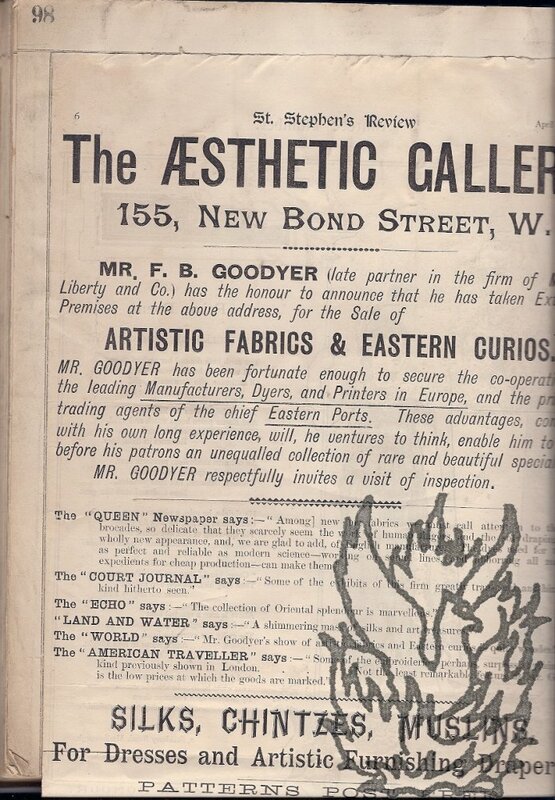 ); c.
Substantial collection of press cuttings relating to the arts and crafts firm of F. B. Goodyer of 55 New Bond Street (The Aesthetic Gallery), assembled for the firm by press cuttings agencies. With a few photographs and other items of ephemera. From the firm's foundation in 1889 to 1947. 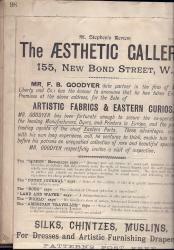 Goodyer has long been recognised as a significant figure in the arts and crafts movement (see Adburgham's 'Shops and Shopping' and Aslin's 'Aesthetic Movement, Prelude to Art Nouveau'), but surprisingly little is known about him. A former partner in the firm of Liberty's, he founded his Aesthetic Gallery at 55 Bond Street in 1889. It specialized in 'English silks, cashmeres, velveteens, fans, cushions, handkerchiefs, table covers, and other dainty manufactures', and numbered Voysey among its suppliers. Manuscript letter, in a secretarial hand, signed by Stephenson as 'Keiro'. 11 August 1908; 124 Regent Street. 12mo, 1 p. Eleven lines of text. Good, on aged and dusty paper, with minor traces of mount adhering to blank reverse. The delayed reply is due to the fact that he only returned from the continent on the previous day. 'My fee for a full consultation Palmistry Psychometry & Crystal is £1 - 1 - 0'. As he is 'very busy', an appointment is necessary 'to avoid disappointment'. Fairburn's Genuine Edition of the Death-Bed Confessions of the late Countess of Guernsey, to Lady Anne H*******; developing a series of mysterious Transactions connected with the most illustrious Personages in the Kingdom: to which are added, [...]. London: Printed and Published by John Fairburn, Broadway, Ludgate-hill. 8vo: iv + 48 + [ii] pp. Last leaf carries advertisements for works by Fairburn. In marbled wraps. Text clear and entire. On aged paper with slight wear and fraying, small holes and light stains to first four leaves. Title continues '[...] to which are added, The Q-'s last letter to the K-, Written a few Days before Her M-'s Death, and other Authentic Documents, never before published. | [quotation] I am the Viper that has been secretly wounding you both. Autograph Letter Signed, a reference for Robert Abraham. 26 April 1825; Laurence Pountney Lane, London. 4to, 1 p, 7 lines. Text clear and entire on lightly aged and discoloured paper. Nicely connecting two notable nineteenth-century London architects. I'Anson has 'great pleasure in stating from long and intimate personal acquaintance with Mr Robert Abraham that his experience Talent and integrity qualify him to fill any office connected with his profession creditably to himself and beneficially to his patrons'. Docketed on reverse of second leaf of bifolium 'No 9 | Edwd I'Anson Esq'.